Here is another the happy news for traders, After Real Time Feeder we are introducing another application called Nest to AmiBroker Data Feeder (NADF). Nest to AmiBroker Data Feeder is a utility which facilitates to transfer data from NEST Trading Terminal to Amibroker. Which provides RealTime and Backfill data to Amibroker from Nest Trading Terminal, it supports NSE equity, NSE futures and Option, MCX, Currency Market (CDS), and also BSE Exchanges. Nest to AmiBroker Data Feeder takes Real Time data from Nest Terminal using RTD feature of Nest Terminal and it provides Backfill from Nest Plus Data table, also provides google Backfill for NSE equity stocks. Updates RealTime Tick data to Amibroker. User can backfill data using Nest Plus data table. Yahoo backfill facility available for NSE equity stocks. 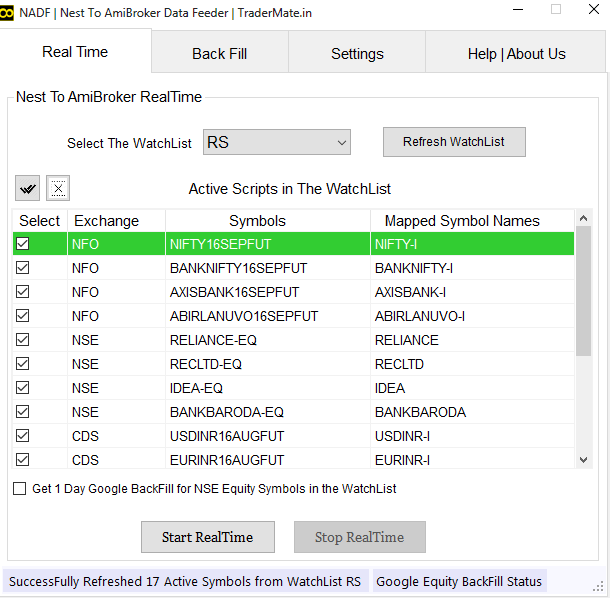 User can Map the watchlist symbols as he required. Works On booth 32 and 64 bit operating system. Easy to navigate the application. Supports NSE equity, NSE futures and Option, MCX, Currency Market (CDS), and also BSE Exchanges. Nest to AmiBroker Data Feeder is freely available to test with limited feature and after testing if you feel Nest to AmiBroker Data feeder is perfect application for you then you can get the Nest to AmiBroker Data Feeder PROFESSIONAL version for a onetime small Remuneration fee and use the Nest to AmiBroker Data Feeder for life time (No Monthly plans nothing. Just one time fee). You can pay the Remuneration Fee for our work using your credit card / debit card or net banking facility and get NADF Professional Version. It is a flat one-time fee (not a subscription) and you can use the program for life. You also get free technical support over email. NOTE : You Should Provide a GMAIL ID while paying for the NADF Pro(where you have to enter your email id). NOTE: Fees once paid will not be refunded, so we recommend you to download Trial version and test, if NADF suites you then go for Pro version. * We have checked NADF with NEST 3.11 and 3.13, 3.14 and 3.16 it is compatible with this version, may can check it with other version of NEST Terminal. *Click here to Know How To Use Nest To Amibroker Data Feeder. * We are not authorized data reseller, we are providing data from available free sources . We are not responsible for authenticity of data. Does this utility checks validity at your server? any ping to your server for response? Yes, it connects to server to check validity. To Get realtime data using NADF, you need nest terminal, nest will also get data from its server. So are you able to use nest in your office? Sir all foreign websites are barred at my workplace. On special request I took exemption for Nest software only. I dont know how it works but only nest software works and no other website is accessible at my desk (nseindia, tradermate, google finance.... nothing). So i suspect that your software wont work in my office. NADF is for Nest terminal. If so then NADF may not work. Please check your mail box, reply is sent to it. How to use NEST PLUS data table backfill ? Do I require any license for that ? I want to extract 3 min intraday data of NIFTY17MAr Futures. using nest data table backfill can be done for how many days for eod and ieod data of nse equity? You can get maximum of data provided by nest terminal. thanks ....do you know for how many days Zerodha and Tradejini give since I have their accounts. And are those data 1:1 spitted? Since google data is not splited that is a great problem you know. I have no idea about zerodha, i think tradejini gives 20 days data. Try restarting Nest and NADF. Check out the help file from the software. "Nest to AmiBroker Data Feeder is freely available to test with limited feature and after testing if you feel Nest to AmiBroker Data feeder is perfect application for you then you can get the Nest to AmiBroker Data Feeder PROFESSIONAL version for a onetime small Remuneration fee and use the Nest to AmiBroker Data Feeder for life time (No Monthly plans nothing. Just one time fee). " see you have mention in your websites. can i transfer license to other computer if required?? Mail us before changing your computer. having Ox87 error in trial version. why are you keep deleting my post.Is there any problem with software.I was thinking to buy.But instead of giving solution you are just keep deleting my post regarding error in software. We are not deleting your post, it will not appearing on our website but we are replying via mail. For the error, Please check that your terminal has RTD feature, try reinstalling the software. It only works with Nest Terminal. PLEASE SUPPORT THAT HOW TO IF SOLVE I BUY THAT SOFTWARE THANKS.PLEASE . Some brokers still provide data table and we cannot use VWAP as intrday data for backfill. Hi am I able to multiple machine log in for nafd? Yes possible, by requesting us. Getting "ERROR WHILE BACKFILL" from last 2 days, unable to backup, same case with my friend using NADF. Tried enabling and disabling Firewall and Antivirus, used the updated version that you sent, nothing works. please update. How to get real time excel data into Amibroker through DDE.